Congratulations to Katherine Koller and Natasha Deen, who have both made the Alberta Readers’ Choice Awards shortlist. Natasha Deen’s Gatekeeper is the second book in her Guardian series. Watch for the final book, Game’s End, this fall! Art Lessons by Katherine Koller is a crossover fiction title, appropriate for teenage audiences as well as adults. Art Lessons is a novel about art and growing up on the outside. We are pleased to announce Lyse Champagne’s The Light That Remains has been shortlisted for the Danuta Gleed Literary Award! The Manitoba Book Awards have announced this year’s shortlist, and we are delighted to see Great Plains authors on the list! Gordon Goldsborough’s Abandoned Manitoba is up for the Isbister Award for Non-Fiction, the Manuela Dias Book Design Award for General Illustration and the Mary Scorer Award for Best Book by a Manitoba Publisher. Her Darling Boy by Tom Goodman is up for the Manuela Dias Book Design Award for cover design and we are thrilled to see Tom recognized in the Eileen McTavish Sykes Award for Best First Book category. Rounding out our nominations is The Shadow Over Portage and Main, edited by Keith Cadieux and Dustin Geeraert, which is up for the Carol Shields Winnipeg Book Award. Great to see all of the Weird writers recognized for their creepy take on Winnipeg. Congratulations to all of the nominees! For details on the awards, visit the Manitoba Writers’ Guild event page. Congratulations to Richard Van Camp and all of the ReLit Awards Shortlist nominees. We are thrilled to see Night Moves on this distinguished list! Congratulations to Natasha Deen – Gatekeeper has been selected as a Best Book by the Canadian Children’s Book Centre! Pick up the Fall 2016 edition of the magazine for full details. Author Wins Cross-Border Fiction Prize! We also received word this morning that Madder Carmine, as well as Natasha Deen’s Gatekeeper, have won Silver medals at the Moonbeam Book Awards. An excellent start to the fall season! We are back from an excellent holiday break. We hope you had the chance to spend quality time with friends and family! Excellent news for our first 2016 Monday: Hello Sweetheart is on the ReLit Shortlist. This collection from Elaine McCluskey received a strong critical response when it came out, and it’s great to see it now garning attention from the awards. Congratulations, Elaine! Both Wish You Were Here and From The Barren Lands made it back onto the Bestseller list in Manitoba during the holiday rush, while Madder Carmine popped back on the Edmonton list. If you are still in need of copies, venture out to your local bookstore now that you don’t have to wait in line! Great Plains Teen Fiction is honoured to announce that Jan Andrews has been shortlisted for the Ontario Library Association’s Forest of Reading prize. Jan’s novel, The Silent Summer of Kyle McGinley, is one of 10 novels selected from across the country for the White Pine Award. 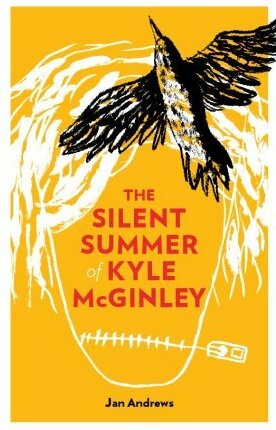 The Silent Summer of Kyle McGinley is written from the point of view of Kyle, a young teen who finds himself at the novel’s start moving into his latest in a long line of foster homes. He takes a vow of silence – if no one listens, what’s the point of talking? But during his first summer on Scott and Jill’s farm, with the help of a crow, a swamp and some black paint, Kyle wonders if maybe his life could be better. Great Plains Publications once again has a title on the short list for On The Same Page Manitoba. Stuck In The Middle: Dissenting Views of Winnipeg is in the running to be chosen as Manitoba’s next Book Club pick. The public is encouraged to vote for their choice between now and September 15th. On September 11th, excerpts from all of the books will be read at McNally Robinson on Grant. 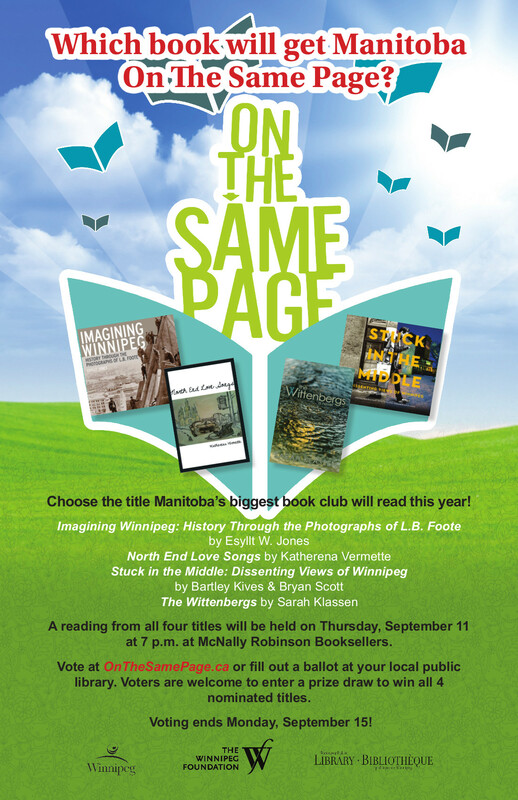 On The Same Page is an initiative of The Winnipeg Foundation and Winnipeg Public Library, and encourages all Manitobans to read, and talk about, the same book at the same time. Congratulations Bartley Kives and Bryan Scott! Spring has finally sprung in Manitoba, and our latest releases have been garnering strong reviews. Pickle Me This says Lee Kvern’s 7 Ways To Sunday is “wild instead of farmed, 20-some years of stories gathered together for the first time instead of a carefully curated collection … I loved this book, hooked by the first story.” 7 Ways to Sunday was the #1 fiction bestseller in Calgary last week, and Lee is on the road promoting the book. Check out one of her events near you! 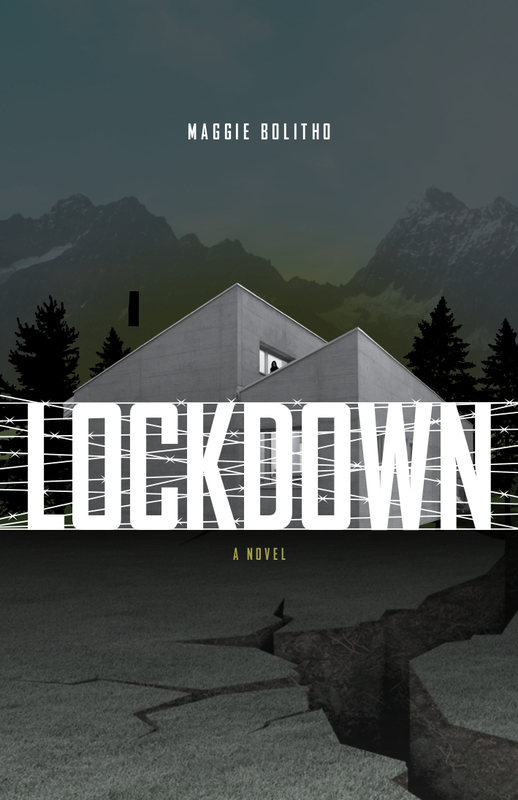 First-time author Maggie Bolitho has launched Lockdown, and a glowing review of the book is already in! “I would give this story a two-thumbs-up and highly recommend it for teens as well as adults … There’s just the right mix of suspense and action that keeps the reader barreling along at break-neck speed” says Susan Rocan on her blog, MyWithershins. The Manitoba Young Readers’ Choice Awards have been announced, and Morven and the Horse Clan by Luanne Armstrong has made the shortlist. We are entering the second printing of this novel released in the fall of 2013. Get your copy today! Finally, our spring releases continue! John Toone’s Fishin’ For Dumbasses: Tips for folks who want to catch their own food (and have fun doing it!) launches Wednesday, May 14th at McNally Robinson in the restaurant at 8 pm. We’re told fish will be on the menu, so get down to Prairie Ink Cafe early to enjoy a delicious pre-launch meal! The nominees for the Manitoba Book Awards have been announced and we are thrilled to see multiple Great Plains titles on the shortlist! 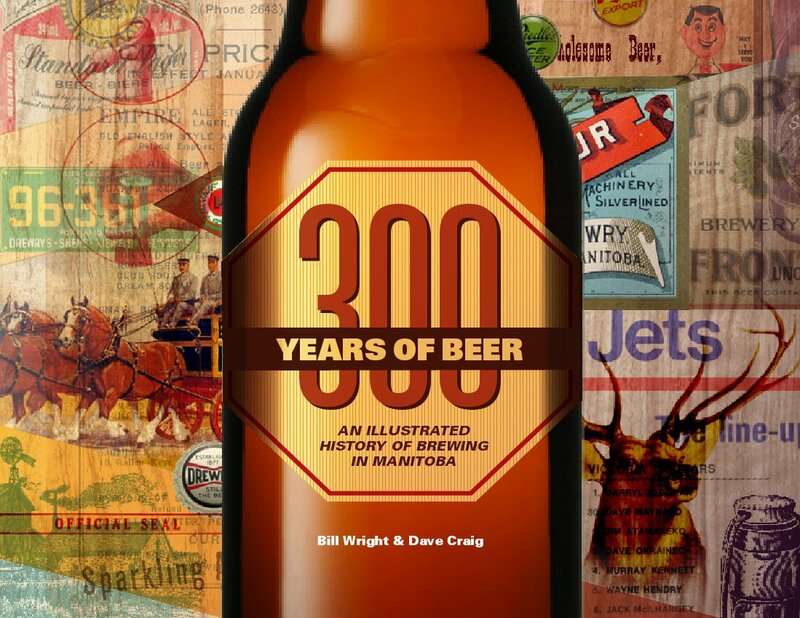 300 Years of Beer, penned by local beer aficionados Bill Wright and Dave Craig, is up for three awards. The illustrated history is up for the Best Illustrated Book of the Year, the Manuela Dias Book Design of the Year, and the Mary Scorer Award for Best Book by a Manitoba Publisher. Bartley Kives and Bryan Scott’s hit Stuck in the Middle is shortlisted for the Carol Shields Winnipeg Book Award. The Fall by Colleen Nelson is up for the McNally Robinson Book for Young People Award. We hope to see Colleen as the two-time winner of this category (her first novel, Tori By Design, received the award in 2012)! You can find all of the nominees on the Manitoba Writer’s Guild website. The Awards Ceremony takes place Sunday, April 27th at the West End Cultural Centre. Congratulations to all of those nominated for the Manitoba Book Awards!